For many, it’s a yearly pilgrimage; for some, it’s a first-time excursion; for all involved, it’s one of the most exciting and thrilling weekends of the year. 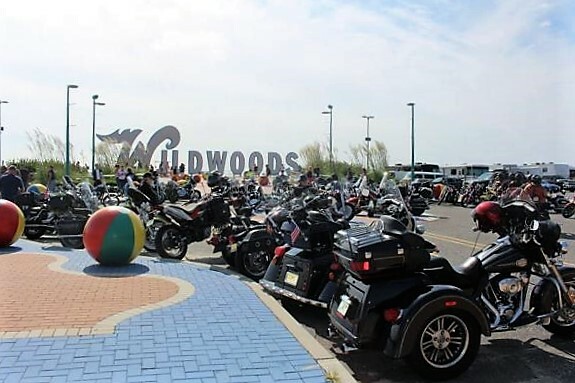 The Wildwoods Roar to the Shore Motorcycle Rally, the largest free motorcycle rally in the northeast, is set for Thursday, September 7 through Sunday, September 10, featuring free live entertainment, motorcycle vendors, food and merchandise vendors and one-of-a-kind events all weekend long. Roar to the Shore thrives in the Wildwoods because of the shore destination’s centralized location on the east coast. Located 150 miles or less from most major cities including Philadelphia, New York City, Baltimore and Washington, D.C., there’s no need for people to trailer their bikes to this rally. They can just ride in, sit back, relax and enjoy the festivities, or take a ride along the scenic roads of Cape May County. There will be hundreds of national vendors located throughout five separate vending lots peddling everything from cigars, to leather, to jewelry to motorcycles. Whether looking for motorcycle parts, paint or patches, you’re guaranteed to find what you’re looking for at this major event. Roar to the Shore will also include free concerts all weekend long at the all new Music & Food Pavilion located in the Wildwoods Convention Center Parking Lot featuring some of the top classic rock tribute bands in the region. The line-up includes Light My Fire, a Tribute to the Doors on Friday from 4 - 6 p.m.; and the Brandon Ireland Band on Saturday from noon - 3 p.m., followed by LED Blimpie, a Led Zepplin Tribute Band from 4 - 6 p.m. Decade, a Neil Young Tribute Band, will also perform on Saturday from 7 - 9 p.m.; and the Brandon Ireland Band will again play on Sunday from noon - 3 p.m. There are also fun events such as a Rubber Duck Boardwalk Ride and Harley Davidson Motorcycle Give Away, a Custom Boardwalk Bike Show, and a Bike Lights Show. Vendor areas are open from 10 a.m. - 10 p.m. on Thursday, Friday and Saturday, and from 10 a.m. - 6 p.m. on Sunday, and are located in the Wildwoods Convention Center parking lots at Burk and Ocean Avenues as well as Oak and Atlantic Avenues in Wildwood. Roar to the Shore is packed with pure entertainment from start to finish. Come and see for yourself how local officials, law enforcement, restaurant and bar owners, sponsors and rally attendees all come together to make Roar to the Shore one of the largest and best free motorcycle rallies on the East Coast. For more information, a detailed up-to-date event schedule, or to register for the Custom Boardwalk Bike Show please visit www.RoarToTheShoreOnline.com or call 609-729-8870.